As we (don’t) say in French, the proof is in the pudding, so as soon as I got home, I decided to give my new levain a run for its money (for info concerning this levain, see here and here). I chose to make simple batards, using 30% organic whole grains (60% red wheat, 30% spelt and 10% rye) which I milled in my little handmill (I have since purchased an electric one for various reasons, chiefly because I couldn’t get fine enough flour with the handmill and ended up wasting a lot of the nutrients present in the grain). The bulk of the flour was Whole Foods’ 365 all-purpose organic and I used some raw wheat germ as well (to compensate for the coarse elements I had to throw away). Dough hydration was 85%, quite high but necessary considering the proportion of whole grains. I keep it at 65%, which I find a good compromise between firm and liquid. It isn’t too stiff to fold by hand (since the folding needs to be very gentle, it doesn’t stress my wrists which I have to watch as I already had surgery on both) and with the daily addition of 30% freshly milled whole-grain flours, it would become too hard to control if the hydration was higher, especially since I keep it at room temperature. I use 1% sea salt at each feeding to prevent the enzymes from running amok anyway. It is still a very young levain (not even one week old) and I am curious to see how it will evolve. Calvel recommends using salt in the levain in Le Goût du pain (The Taste of Bread) (p. 61 in the French edition. I was unable to get the English translation from my local library, so I can’t give you the page number in English. Sorry about that…). “Pourquoi ajoute-t-on toujours un peu de sel au rafraîchi ? Parallèlement aux levures sauvages, l’acidité se développe, ainsi que certains enzymes appelées protéases. Ces enzymes ont une action néfaste sur le gluten et le liquéfient, ce qui rend la pâte molle et très collante ; le sel ajouté au rafaîchi bloque l’activité des protéases”. (Why add salt to each feeding? Parallel to wild yeast, acidity develops [in the levain] as well as some enzymes, called proteases. These enzymes have a harmful effect on gluten which they tend to liquefy, making dough slack and very sticky; salt blocks protease activity) (my translation). The Rustic Batard goes to Susan, from Wild Yeast for Yeastpotting. … and you have your first "à la Gérard Pain au Levain". Great! Oh I am so happy I got my computer going again and then checked your site! I am really looking forward to trying your/Gérard's recipe! Wow, you made a fabulous loaf there madame! Looks awesome! I would like to have a slice of it right now, please!!!! Wow. Truly fantastic and inspiring bread. I'm so glad the hard work with the levain paid off. I'm sure the flavour and aroma must be amazing. This is driving me ever closer to biting the bullet and getting a grain mill and maybe a temp-controlled proofing setup. @Giovanni, the flavors are not the same as Gérard's. Even though I used the same percentage of whole grains blend, I found that the rustic batard came out darker and tasted more of whole grains than his. @Zorra, too bad you live so far away. I would just tell you to drop in for a taste! @FP, thank you! I have to say that in the space of 48 hours, I have already grown very attached to this little mill. I can taste the spelt and the rye each time I bite into the bread. Truly delicious. I know I got all this in all the classes over the years, but somehow you make it all clear to me now!!! Wonderful looking bread, as usual MC. I wish I was close enough to invite myself over for lunch! @Jeremy, thank you! Seeing Gérard work is like seeing a French professional baker's handbook come to life. @Teresa, it'd be so much fun to have you over. That is a beautiful looking bread. I love homemade breads. (1) The crumb color: I compare your crumb shot with the one on your first Gerard Rubaud story in November, I could not tell the difference; I thought the color look very similar. But I'll take your word for it. What do you think is the reason behind your darker color? (2) The taste: you said your rustic batard tastes more whole-grains than Gerard's. 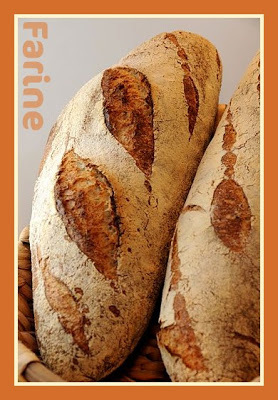 I would have thought Gerard's tastes quite whole-grains too because on a total flour basis, WW flour works out to be 18%, spelt 9%, and rye 3%, totalling 30%, which to me is high enough to make a "strong" mark on a Pain au Levain. In fact, I am surprised that Gerard uses such high percentage of whole grain flours. On the other hand, both of your crumb looks light and delicate, so the balance is definitely there. It is most interesting for me to see how he strikes that balance between light texture and full flavor. Bravo! Wonderful batard! And the fact that its not sour makes it very desirable for me. I will try Gerad's methode to create a levain for sure! After running (again) into some stubborn german bakers, who just accept their methode of handling a sourdough (and everything else is totally wrong and will kill the yeast (like feeding the sourdoug twice a day instead of storing it in the fridge. I can not understand why somebody can belive that feeding! could kill yeast) its so good to see that there are bakers who like to test diffrent methods as much as I like it! What a beautiful batard! The crumb looks wonderful and delicious! @Shiao-Ping, re: crumb color. Maybe the reason mine is darker is that Gérard and I don't source our grains from the same place since I live about 5 hours away from him and also that he uses part winter wheat and part spring wheat in his levain. I don't have access to spring wheat where I live, only to hard red winter wheat. Re: taste. I couldn't tell you. Spelt shines through very clearly in mine, maybe more than in his. His bakery is about 15ºF warmer than my home and, from what Gérard says, it plays a huge role in the aromas, not to mention the fact that he feeds his levain every 5 hours and I do it twice a day. @Stefanie, it is so interesting that you should say that. I took a German Breads class last summer and was surprised to hear that German bakers renew their starters every 2 or 3 months, to the point that some of them subscribe to a service that sends them a new one periodically. I always thought that the older a starter, the better the aromas. But it turns out that Gérard thinks exactly the opposite. In that respect, he does as the German bakers do and changes his starter regularly (although he wouldn't dream of entrusting the task to a service). German bakers keep mostly rye starters, right? So I thought that was the reason. But then I met Jeff Hamelman (who was trained by a German baker) and here he is with a rye starter that is about 30 years old, fed twice a day and going strongly. I have come to the conclusion that the only rule is : whatever works! Love your blog. I have always loved baking bread but have yet to master even a part of it. I do enjoy the wetter doughs. I am trying the Pain a l'ancienne Baquettes from "applepiepatispate" site tonight to serve with dinner. I also have a brick oven which has given me the best pizzas with the wood flavor but I have yet to time the bread and the oven for rustic breads properly. Thanks for all of your information. I hope to put the brick oven to good use as my experience level improves. Thank you, Shawn. I am looking forward to hearing more about your experience. Sounds to me that you are already ahead of the game with that brick oven! How were the baguettes à l'ancienne? @ MC: German bakers keep mostly rye starters, thats right. (I do not because I react alleric when eating rye in higher amounts.) But I do not know one (home-)baker who would renew his starter after 2 or 3 months. Like you everyone is convinced that the older the starter is the better the flavor becomes. But maybe it is true for commercial bakers? I will ask "Bäcker Süpke" a German commercial baker who has a very nice blog where he shares great recipes. The most common way to handle a starter here is to keep it in fridge untill it is used again. When I mentioned in a forum that I keep my starter on the counter and feed it twice a day they called me crazy (To much feeding would kill the yeast thats what they told me … ). I have sometimes the feeling that in this particular forum sourdough is not longer a matter of baking but a matter of religon. Handling a starter in an other way as the way it was always done is heretical. Luckily there are (german)bakers in the blogsphere who like to experiment with new methodes as much as I! "I create a new Sourdough each week indeed. I get a fresh starter from a company,a so called pure culture sour (Reinzuchtsauer). The reason for this is that when maintaining a sourdough for a longer periode other bacteria will contaminate the sourdough, especially when the sourdough is used as much as in a bakery. 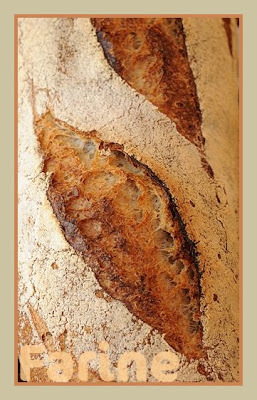 To replace the sourdough frequently is a recommendation of bakery schools, too. In the past I did not replace my sourdough regulary and ended up with an "ill" sourdough! But there are also commerical bakers who keep their sourdough for years and telling everyone proudly that this sourdough is something special. But all other bakers smile on those bakers." Hi, Stefanie, Bäcker Süpke's reply is indeed very interesting. Especially to me as I have seen, smelled and tasted Jeff Hamelman's rye starter which has been producing bread at the bakery for close to 30 years, is fed twice a day and kept out of the fridge and it seems super healthy to me. It certainly makes good bread. I conclude that whatever method works is fine and that we should feel free to experiment and choose the one that we can the most easily live with and gives us the results we like best. Plus nothing prevents a home baker to start a new starter while continuing to maintain the older one and bake with both and compare, right? Can I please ask what is Gerard's levain baker's percentage? Your levain is 40% to your final dough flours (or 38% if you include wheat germ). You may have mentioned somewhere else something like 25% is what Gerard uses for his pain de tradition. Is that correct? Shiao-Ping, the percentage of levain in Gérard's dough can go from 25% in the summer when it's very hot and humid out to 40% in the winter when it is very cold outside. Generally speaking the average is about 30% in the summer and 35% in the winter. 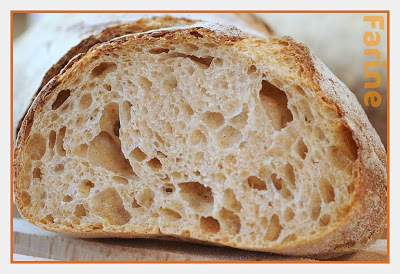 A lot of food for thought here… wonderful bread and wonderful post, I enjoy your blog so much! Hi, Zeb, thanks for your visit and your kind words. You are right, from what I understand, the levain benefits greatly from just-milled flours, provided they are whole-grains. A white flour such as the all-purpose flour we use for artisan bread basically acts as a filler and it has to be used either within the first 24 hours after the milling (which realistically never happens, except maybe at the mill) or after 3 weeks (or at least after enough time for the starch to have at least started its conversion to sugar). How does Gerard start a new culture when he refreshes his starter? Does he use a tiny bit of his old starter or start completely new with just flour/water? I was a little lost in the explanation of starting a brand new starter, are you saying the starter that you made while with him was prepared without any old starter added to it? I.E. a new, baby starter? What a wonderful write-up, fascinating! Now I have to go buy a mill, won't be able to live without it! Yes, the starter I made with Gérard was a baby starter. No old starter was added to it in any shape or form. Gérard changes his starter every 2 or 3 months, depending on how satisfied he is with the aromas he gets with the current one. He usually starts a new one with pieces of the old one which he has dried out at the peak of its performance. He also sometimes starts from scratch (but that's usually when he wants to try something new).